Refining (Downstream in the oil & gas value chain) is where the primary industry raw material (crude oil such as WTI) is processed into refined products (gasoline, jet fuel and fuel oil) and sold to the end user. Refined products are piped off to storage via refined product pipelines where they are loaded to trucks and driven to points of sale (gas stations, airports). There are no public standalone refinery companies in Canada (Irving Oil is private), but Suncor, Cenovus, Imperial Oil and Husky have refinery operations in Canada and the United States. Shell and Chevron have refineries in Canada. Globally, refiners may be part of integrated oil companies, petrochemical companies (INEOS), or standalone downstream companies. 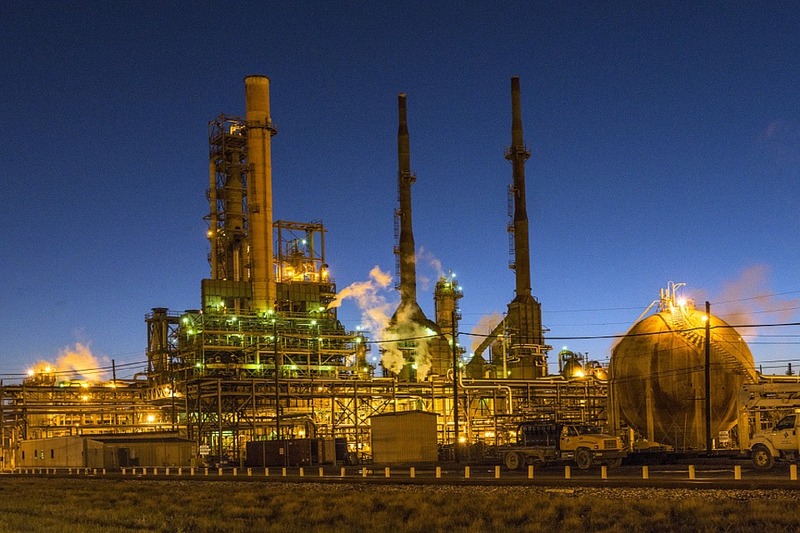 Prominent refiners include Valero, Phillips 66, Marathon Petroleum, HollyFrontier and Tesoro. Refineries are capital intensive, with high fixed costs and low variable costs. While the midstream industry is quite stable, downstream is more volatile (but less so compared to upstream exploration & production). The downside risk to volatility stems from liquid (actively traded) markets and production lags. Due to the time it takes to refine a barrel of oil, it is possible that the time between purchasing the oil and selling the refined product to market has resulted in a lower than breakeven price for the refined product. Given this dynamic, most refiners actively hedge out the crack spread to lock in margins. Refineries buy the input or feedstock (crude oil) from the upstream or oil producing company, where it is subsequently moved through pipeline to the refiner. The refiner then transforms the crude oil into refined product (gasoline and fuel oil) which is ideally sold at premium to the crude oil. The difference between what refiners sell the refined product for and what they bought the crude inputs for is called the crack spread. In addition to marketing through gas stations, downstream (and midstream) companies engage in commodity trading. As this is an attempt to profit from risk taking, this can have large non-core operating ramifications on earnings. Simple refineries are designed to process light oil into a smaller range of refined products, which are lighter hydrocarbons (such as gasoline and diesel). Given that the process is simpler and the feedstock (light oil such as WTI) trades at a premium to heavier crudes (heavy oil such as Western Canadian Select or WCS), simple refineries will tend to capture weaker margins than a more flexible refinery. At the most basic level, refining is just distillation. Crude oil is a mixture of several components, some which are lighter and more gaseous and others which are heavier and more liquid/solid. Each of these components will have different boiling and freezing points, so the distillation chamber will heat and isolate products. Gasoline will still have to be reformed for consumption in cars at this stage. More flexible refineries are known as complex refineries, which have more tools at their disposal to break down longer hydrocarbon chains and turn less useful hydrocarbons into hydrocarbons appropriate for use as a transportation fuel. Complex refineries are also useful for treating crude – removing impurities and contaminants such as sulfur and salts (not table salt). Complex refineries break down hydrocarbon chains through processes called coking and cracking. For coking, the refinery heats residual oil to very high temperatures (600 degrees) to yield lighter products such as naphtha. Cracking uses a catalyst to break the hydrocarbon chains into smaller chains. 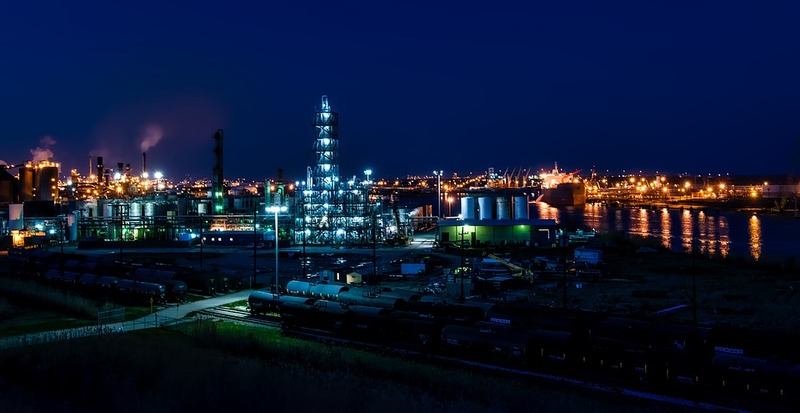 Depending on market needs, refineries may be reconfigured – for instance if there is an abundance of heavy oil, it may make sense for a simple refinery to add equipment that is typical of a complex refinery, such as a cracker or a coker. There is a capital expenditure tradeoff between simple and complex refineries. Simple refineries require lower capex but are lower margin – however they also have lower fixed costs, so if a large refinery is unable to sell refined products at an appropriate price due to an inability to source product or due to narrowing crack spreads (while the refinery is relatively uneconomic, possibly due to labor as is the case in many European refineries), a complex refinery can be detrimental to an oil company’s return on invested capital. It has been a trend for large integrated oil companies (IOC) to spin-off their downstream business due to the difficulties of vertical integration and to realize a cash injection due to willing buyers of economies of scale (sum of the parts valuation works). A good example from recent memory is Marathon Oil and ConocoPhillips. Refiners and integrated oil companies (such as Shell) have also been spinning off or selling working interests in their midstream assets (pipelines and storage). Often, this will be into a Master Limited Partnership (a tax structure available in the US and not in Canada), making it attractive to investors due to the tax passthrough efficiency. Midstream assets are stable, toll-like cash flows and as such MLPs will trade at a higher multiple outside of the integrated oil company. Spinning out the MLP will allow for the integrated oil company or refiner to use the proceeds for higher returning business activity. However, due to the importance of these assets to the value chain, as locking in supply to the refineries via the pipelines is paramount, the midstream assets will not be sold off in their entirety, with the parent company keeping a stake and continuing to operate the asset as the General Partner (GP). Usually, if the midstream assets beat mandated targets, the general partner will be allowed to earn a higher performance fee. Downstream companies and the refining units of large oil companies have also been spinning off their retail divisions (gas stations). Although highways and cities will be saturated with Esso (Imperial Oil/Exxon), Petro-Canada (Suncor), BP and Shell gas stations, these are actually owned by large retail companies that specialize and get scale advantages such as Alimentation Couche-Tard and Parkland Fuel. Oil and gas companies and refiners will still keep gas stations that they consider core or have good synergy value (close to refinery, strategic location). As North American refiners are standard garbage-in, garbage-out companies that do not have too much commodity price risk (given the margin nature of their business which is largely hedged), they are valued on Price/Earnings, EV/EBITDA and sometimes as a Dividend Discount Model Discounted Cash Flow or on a dividend yield basis. If the refinery has extensive marketing operations, midstream assets (pipelines, barges, rail terminals), analysts may use a Sum of the Parts valuation methodology. However, the valuation drivers for the multiples they trade at can be exhaustive. Refiners that trade at premium multiples will have well positioned refineries or can lock in an uninterrupted, low-cost supply of crude oil. If a Gulf Coast refiner has strong, contracted volumes for discounted heavy oils such as Western Canadian Select from Alberta, it will realize industry beating margins. Complex refiners that are flexible will also receive a premium versus peers as they can opportunistically switch between light and heavy feedstock depending on cheapness. Proximity to key end markets is also important. Gulf Coast refiners are not landlocked like refiners in the Midwest are, and can ship gasoline by tanker to demand markets such as Latin America and Europe. The US is the world’s largest consumer of crude oil, but much of the refined product yield from the crude oil is actually sold off as the US has some of the most efficient refineries in the world with the cheapest feedstock (China also imports oil, adds value via refining and re-sells gasoline). As such, access to tidewater is a positive for valuation. Marketing assets can be hit or miss – the existence of a trading division, even if it is very sophisticated and consistently profitable, may trade at a much lower multiple to the standard refining operations. This is because earnings are volatile and benefit from widening differentials given good supply chain access and market knowledge. The largest public oil company in the world (ExxonMobil) does not play in the oil marketing space. In addition to these considerations, analysts focus heavily on the refiner’s return on invested capital (ROIC) as a measure of appropriate returns on investment. Generally, a high ROIC will point to a premium valuation, with the logic that the stock may be expensive now, but would be cheap next year if multiples stayed the same. As these factors are baked into current valuation, for an analyst to generate alpha with refining stocks, they have to accurately predict performance pertaining to consistency (no unplanned turnarounds), derisking of new refinery projects (execution) and the flow of oil (debottlenecking of oil pipelines, oil projects delayed or ahead of schedule and the hedged or unhedged nature of the refinery’s capacity). Given the opaque and unpredictable nature of these considerations, picking the right refinery stocks is very difficult. Secondary valuation metrics include Enterprise Value/Daily Barrels of Capacity or Throughput and Price/Book Value. The crack spread is the relevant unit net revenue figure for oil and gas companies. The crack spread is the differential between the sale price of the refined products produced (output) and the price of crude oil (the input or the feedstock). Although a useful market number, to paint a full profitability picture, the actual costs of “cracking” or refining the crude oil must be considered as well. Given that costs other than the crude oil can be reasonably predicted, refiners often hedge WTI, refined products or the crack spread itself with derivatives – which may include options, forwards and structured strategies such as collars. Named after major refining centers in the USA (Chicago in the Midwest or PADD II and the Gulf Coast or PADD III), the first number represents the total barrels of crude used and the number of gasoline and fuel oil yielded. 3:2:1 will mean that three barrels of crude oil will yield 2 barrels of gasoline and 1 barrel of distillate fuel oil. A 6:3:2:1 crack spread means 6 barrels of crude oil yields 3 barrels of gasoline, 2 barrels of diesel and 1 barrel of fuel oil or kerosene. Different cities will have different crack spreads due to the difference in feedstock prices where they are and the price of gasoline in the area (gasoline in California will differ greatly from gasoline in Texas). To get to the crack spread, if a refinery sources Light Louisiana Sweet trading at $50 and a barrel of gasoline trades for $80 a barrel while fuel oil trades at $40 a barrel, the sum of the products is $200 while the three barrels of crude costs $150. The crack spread per barrel is therefore ~$13 per barrel. LLS is the crude oil that settles in the Gulf Coast (where the refineries are) versus West Texas Intermediate (WTI), which settles in Cushing, Oklahoma (WTI is often quoted as WTI Cushing or WTI Midland). As such, due to the marginal cost of transport from Cushing to the Gulf Coast, LLS tends to trade higher than WTI by that marginal cost. As LLS is the relevant feedstock for the refineries, the LLS crack spread is the most relevant measure of profitability. The refinery capacity is the limit to the number of barrels it can refine a day. The utilization is how much of the capacity is being used. If spreads are healthy, analysts want to see high utilization and large capacity for the refinery. Sour crude means that it has a sulphur/sulfur content above 0.5%. Sulfur must be removed from the oil before it is gasoline, so the cost of extracting sulfur is embedded into the differential between sour and sweet crude. Accordingly, sweet crude should trade at a premium to sour crude. Sulfur is not a waste item, and extracted sulfur can be used in sulfuric acid. The debt associated with the refining segment should be looked at independently (although this is not necessarily broken out, if unsecured debt is just raised at the corporate level – but they will evaluate each project based on its cost of capital before proceeding). From a credit perspective, E&Ps are much more volatile than refiners, and accordingly, the level of debt that would be considered high for an E&P is much lower than what it would be for a refiner. An integrated oil and gas company would have the best credit quality, all things equal, as it is able to capture the whole value chain and the refinery can offset some oil price volatility (assuming the crack spread widens when the underlying all falls). However, an integrated oil company is less protected against a sharply falling global oil price if refined product prices fall with them. Pipelines, rail, barges and trucks are midstream (upstream to refiners) assets that would enhance credit. Retail outlets (reducing discounts refiners will have to cough up in times of refining overcapacity) and petrochemicals are downstream to refiners. Integration serves as a natural hedge (lower revenue for one equals lower costs for the other). The aggregate crude distillation capacity (measured by thousands of barrels per day or kbpd) of all of a company’s refineries is an important measure. A company with more refining capacity can realize scale advantages through buyer power (can negotiate discounts with producers for a large enough volume). Another scale advantage as having a larger number of refineries ensures that the corporate will still have cash flow if a refinery goes down for maintenance. Refining benefits greatly from scale due to the high fixed costs in operating a refinery. A large refinery network with sizable capacity usually has access to a dedicated logistics team which helps achieve better pricing and allows them to be pragmatic with sourcing different types of crude based on needs. A refining company may also own pipelines and barges and midstream assets. A variety of cash flow measures should be divided by refinery throughput to measure a refiner’s buffer. A credit analyst will want to see if the refiner can handle thinning crack spreads without too much trouble. A refiner wants to be able to sell to a variety of consumers just as much as it wants to be able to source feedstock from a variety of sellers. If a company had refineries concentrated in a politically unstable jurisdiction and war breaks out of the refinery is expropriated, this can be problematic for cash flow. If a company has refineries in underserved markets or in locations where there is no other easy access to refined products, it has significantly more seller power. If the refiner owns the midstream infrastructure that brings the oil to their operations, this is even better from a credit perspective (and for a distressed refiner, is an easy access to sell at a loftier multiple due to cash flow stability). The output that a refinery produces is very important as it drives profitability. High quality product (gasoline, high diesel, lubricants) will result in higher returns than low quality product (fuel oil). This is a good time to look at the mix of the company’s refineries – whether they are simple or complex. Simple refineries are less flexible and handle light crude only. Complex refineries can create a higher quality yield from heavy oil due to more distillation chambers and crackers. Complex refineries are also more flexible pertaining to what feedstock they can use. However, complex refineries will usually have higher costs associated with running them (fixed and variable), so depending on how the underlying supply and demand for crude oil and refined products are, the business environment can favor either. Refiners have turnarounds and maintenance in the ordinary course of business. A good refiner will have minimal downtime as maintenance is expensive and revenue is not being produced because crude is not being refined. An analyst would like to see refiners who finish maintenance ahead of schedule and have operations running smoothly. Recurring unplanned maintenance is a red flag.